Special Note: The 2015 bat is no longer available but the the 2016 bat is available. If you are interested in this model of bat then check this verison out. Otherwise please keep reading for info on the 2017 Easton Mako Beast. Wanting to knock some sense into the ball and make pitchers look silly as you round first base because you drilled another one to the gap? This doesn’t have to be a vision or a dream because the youth Easton Mako baseball bat is making it a reality. The Easton Mako bat is a cool looking piece of equipment. It’s black with the gray and silver logo on the barrel. As you go down towards the handle you have the CXN markings with a gray band. Just above the handle is the MAKO Beast logo in silver with another Easton logo. I think the grip is the best part about it. It’s black through and through which makes the bat look super sweet. The knob is black as well to round it out. 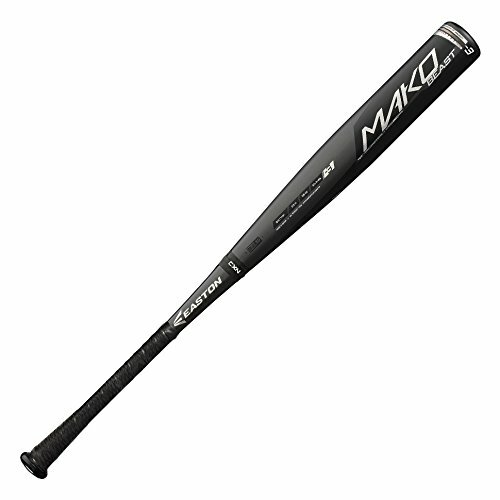 Here’s a picture of the youth Mako bat. If this Mako isn’t for you then there are a few more Easton bats I want to show you. If this is the bat for you please keep reading about the specs and reviews. This is a youth baseball bat. It’s not BBCOR. If you’re looking for BBCOR then you can go here. This specific model is the YB17MK12 MAKO. Easton baseball bats always have good labeling on their products so you know what and where you can use it according to the rules. It’s a two-piece totally composite design with the weight to length ratio of -12. They made this with new TCT Thermo Composite Technology which they say gives the hitter more bat speed than any other one out there. This is what allows you to rip the ball into the gap and hopefully over the fence every now and then. The barrel is 2 1/4″ which is standard for youth leagues and comes in sizes of 28″ to 32″ with corresponding weights of 17 ounces to 21 ounces. The company says this model combines the best of both worlds in regards to their XL1 and S1. So you’ve got the fast swing speeds and the huge sweet spot. In researching this model I’ve come across several players comments and I wanted to paraphrase those for you to get to the meat of the matter. One player said it’s obviously a sweet bat. Beside balanced this one player referred to it as actually having a power boost to it. I’m assuming he’s comparing that to other bats available. The one negative to this model is that everyone on the team apparently wants to use it. I also saw that this bat was used in the Little League World Series and youth players commented that there’s a reason why every kid at the LLWS was using it. Because it’s the best on the market. It’s even listed as a licensed bat with Little League. One parent raved about the balance of the bat over any other feature because he could see his son swing the bat in a precise way he’s never seen before. There are over 80 customer reviews for this bat with a nice 4.6 star rating. Whether you play travel ball, local league ball or whatever…this bat is high quality, performs well and will get the job done for you at the plate. 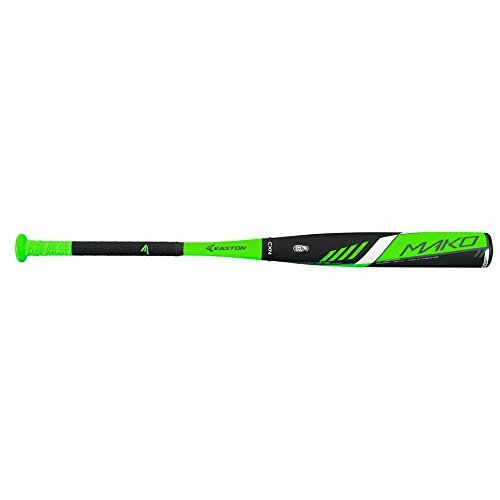 Watch this video to learn all about this cool Easton Mako baseball bat. This video even distinguishes between this model bat and other Easton bats. What about it? Have you used this bat before? If you aren’t actually in the youth bat category check out these other two. Big barrel and BBCOR are your other choices. Learn more about them by clicking on the picture. I loved this 2015 Easton Mako baseball bat but unfortunately it’s not available anymore. Not only that, the 2016 version doesn’t have many left in stock anymore. Again, if you loved this model of bat and enjoyed this Easton Mako review you should consider the 2017 version. It’s not the cool orange or green color anymore but it is a sharp looking black and silver. It’s got over 150 customer reviews and they are all pretty much positive comments. It’s pictured below so go ahead and give it a click. It’s got to be an Easton right? For sure!